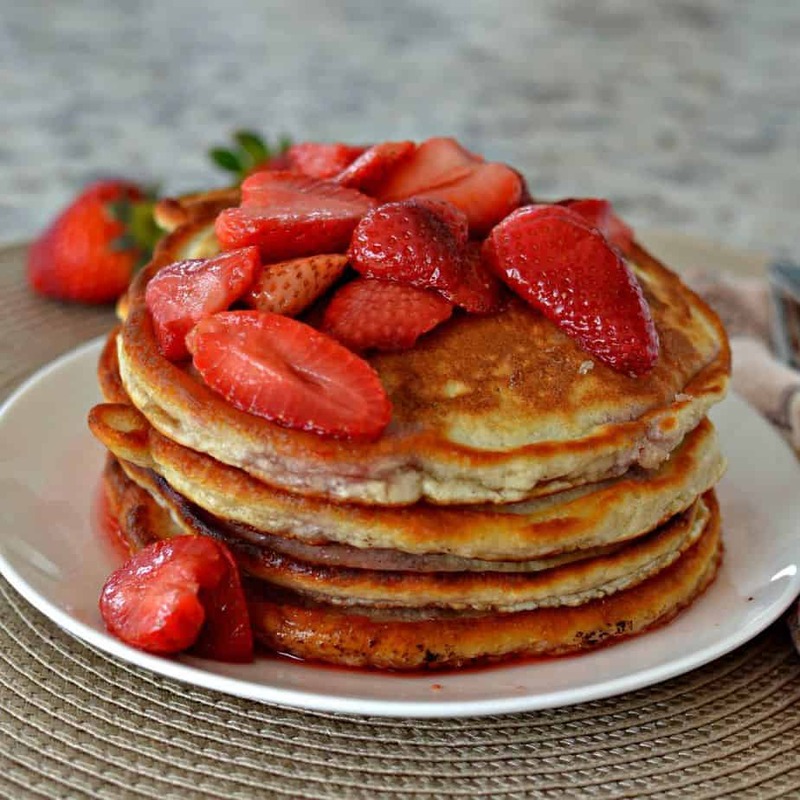 Strawberry Pancakes with Strawberry Sauce are light fluffy pancakes with crispy edges and little bits of sweet strawberries cooked right in them. 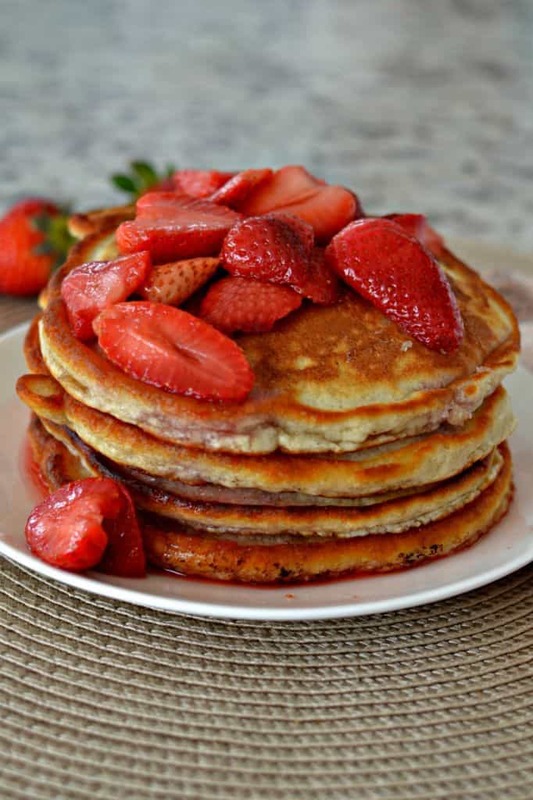 They are topped with a lightly sweetened strawberry sauce. This is a delightful sweet treat for all the strawberry lovers in your life. Every once in a while on the weekends I will get out my large derriere out of bed and make my darling daughter something special and sweet! The key phrase there being every once in a while. I am not sure if it makes her feel special but it makes me feel like I am being a good Mom! She is always appreciative of my effort and savors every bite. Spring is coming and fresh strawberries are making their way to the market. When I pass them at the store I just love the fresh sweet smell. There is just nothing like it!! You may even find yourself enjoying some of this special sweet goodie! There are little bits of strawberry in the pancake and the whole caboodle is topped with glorious lightly sweetened strawberry syrup! 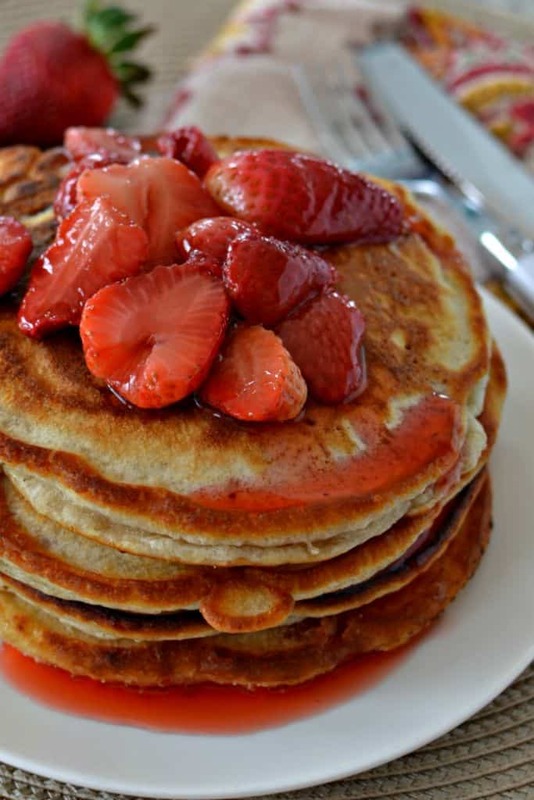 How do you make Strawberry Pancakes with Strawberry Sauce? First lets make the strawberry sauce. Add the cut strawberries to a saucepan and sprinkle with a little bit of sugar. Simmer for eight to ten minutes stirring gently several times. Squeeze a tablespoon of lime juice into the sauce. Combine the milk and vinegar and let it set for about five minutes. In a medium bowl whisk together the flour, sugar, baking powder, baking soda and salt. Melt a couple of tablespoons of butter in the microwave. Stir the melted butter, egg and vanilla into the milk mixture. Now whisk the milk mixture into the flour mixture just until combined. Gently fold in the reserved strawberries. Resist the urge to over-mix since this can make your pancakes tough. Heat a little canola or vegetable oil in a large skillet over medium heat. I like to use my cast iron skillet. Pour one quarter cup of batter to the skillet. Cook until bubbles appear on the surface and the sides are brown and slightly crispy. Flip with a spatula, and cook until browned on the other side. 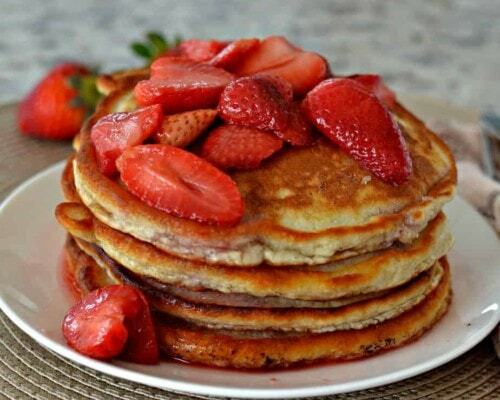 Serve warm with the fresh strawberry sauce. What pan is best for cooking pancakes? My favorite pan for cooking pancakes is my cast iron skillet. I love the crispy edges that I get from that pan. However if you prefer your edges not quite so crispy than use a non skillet with just a little cooking spray. A stove-top griddle works really well too! 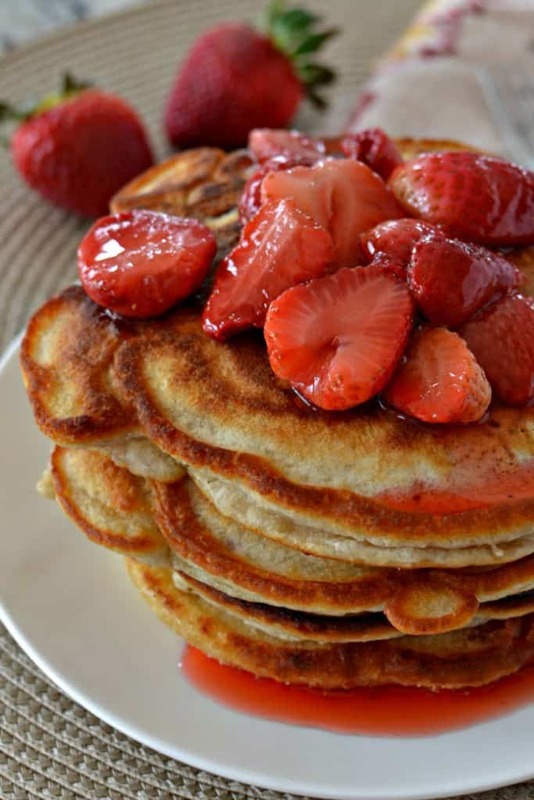 Can you substitute other fruit in Strawberry Pancakes with Strawberry sauce? Yes you most certainly can! For both the blackberries and the raspberries reduce the simmering time for the sauce to about five minutes. 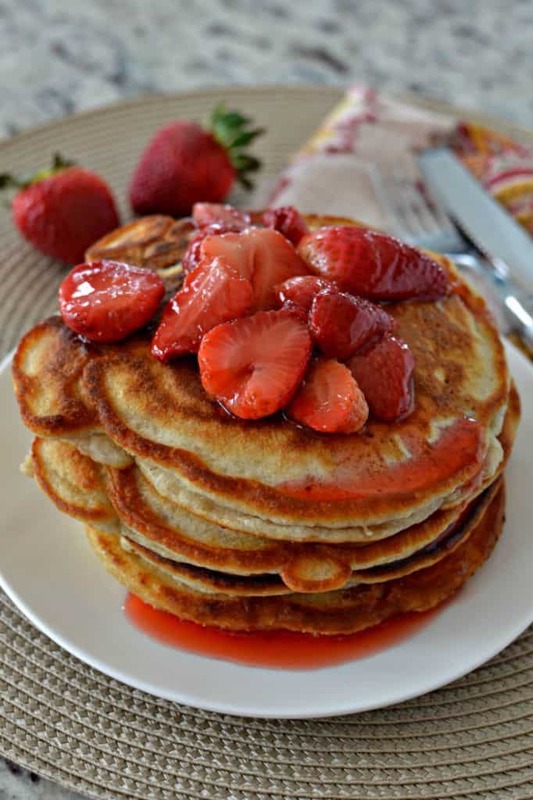 So if you love pancakes and strawberries than these Strawberry Pancakes with Strawberry Sauce are right up your alley. Your family is going to love these sweet breakfast treats. They will be singing your praises and you can smile like a Cheshire cat! This post was originally published June 13, 2015 and was republished February 19, 2019 with new content. Combine strawberries (except for the ones reserved), 1/4 cup sugar and lime juice in small saucepan. Simmer over low heat for ten minutes stirring every couple of minutes. Remove from heat and allow to cool. Sauce will thicken upon cooling. Combine milk and vinegar in small bowl and set aside for 5 minutes. Combine flour, 3 tablespoons sugar, baking powder, baking soda and salt in large mixing bowl. Add melted butter, egg, and vanilla to milk mixture. Pour milk mixture into flour mixture stirring with whisk just until combined. Gently fold in the reserved strawberries; resisting the urge to over-mix. Heat a large skillet over medium heat, and coat with cooking spray. Pour 1/4 cup of batter onto the skillet. Cook until bubbles appear on the surface. Flip with a spatula, and cook until browned on the other side. These will have everyone running out of bed to get some breakfast! I much prefer fruit on my pancakes instead of syrup, but now I’m craving fruit IN my pancakes, too! These look fabulous! My kids loved these! Perfect day starter!